The world knows Winston Churchill as a leader who was a master at harnessing the power of words, a formidable orator with an ironclad grasp of both language and history. He was a prolific writer, his works ranging from the sweeping History of the English-Speaking Peoples to the authoritative Marlborough, the biography of his ancestor. He had a gift for recalling certain historical works verbatim, such as Macaulay's The Lays of Ancient Rome. Yet the general impression was that the boy never was very good at school. 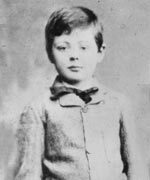 The sweet irony of Sir Winston Churchill's life is that the young lad whom his teachers and his father either dismissed or despaired of became one of the most learned and articulate men of the age. We talked with Richard M. Langworth, the founding president of The Churchill Centre and the editor of its journal Finest Hour, on how Winston Churchill became more accomplished than his father could ever have dreamed. Levenger Press: Why was Winston considered a failure in his first years at school? Richard M. Langworth: Like his alcoholic intake, his school failures were exaggerated, largely by himself. His description in his autobiography of his failure to write a single word of Latin during his entrance exam for Harrow School is highly colored. Harrow historians say it would have been impossible in those days, even for Lord Randolph Churchill's son, to get into Harrow knowing no Latin. In fact, he was quite good at subjects that interested him - history, English, military topics. His problem with subjects such as foreign languages, math and science has been ascribed authoritatively to what we now call ADD, or attention deficit disorder. Churchill was profoundly influenced by his father, and his father never looked upon him with approval, particularly as a student at Harrow. That stayed with him - probably even convinced him that he was a poor student - and emerged in his own self-descriptions. "Churchill was profoundly influenced by his father, and his father never looked upon him with approval." Minister] Gladstone read Homer for fun, which I thought served him right." But some historians say that Churchill's oratorical style was inspired by Cicero's. Would you agree? RML: If so, this is just another proof that he was better at Latin than he let on! I don't know about Cicero, but two more modern orators really inspired him. The first was his father, Lord Randolph, all of whose speeches he read and stored in his photographic memory. You see this in The Dream, where Winston quotes from his father's speech on the Church of England in 1884. He even adopted Lord Randolph's style of dress and pose while speaking. His second influence was the great Irish-American politician Bourke Cockran, whom he met on his first trip to the USA. Churchill wrote of Cockran: "His conversations, in point, in pith, in rotundity, in antithesis, and in comprehension, exceeded anything I have ever heard." 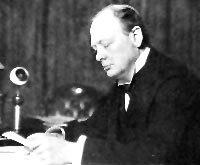 You could fairly say that Churchill's oratorical style was a combination of Lord Randolph's and Bourke Cockran's, with a little of Macaulay's and Gibbon's phraseology, and (as Churchill put it) "some of my own from time to time." LP: Winston did become the only thing his father ever thought he would: a soldier. Isn't this when he also first became a reader, and followed in his father's footsteps as far as what he read - starting with the eight volumes of Gibbon's Decline and Fall of the Roman Empire? and his autobiography; Macaulay's History of England and his Essays; Plato's Republic; Aristotle's Politics; Schopenhauer's Studies in Pessimism; Malthus's Essay on the Principle of Population; Darwin's The Origin of Species. He read the Parliamentary Debates for the last half century, considering which side he would have taken on each issue. He turned to religious works and books challenging religion, such as Winwood Reade's The Martyrdom of Man and Lecky's Rise and Influence of Rationalism and History of European Morals. He memorized Bartlett's Familiar Quotations, and they stood him in good stead as the years went by. Churchill does admit in his autobiography that "It was a curious education. First because I approached it with an empty, hungry mind, and with fairly strong jaws; and what I got I bit; secondly because I had no one to tell me: ‘This is discredited.' ‘You should read the answer to that by so and so; the two together will give you the gist of the argument.' ‘There is a much better book on that subject,' and so forth." LP: How did he become a historian? "He memorized Bartlett's Familiar Quotations, and they stood him in good stead as the years went by." reconquest of the Sudan in 1898. He had determined that the book would begin with a historical account of the country and Britain's role there; it required considerable research, and he was praised for the evenness of his historical backgrounders. His chief inspiration at that stage was Alexander Kinglake, a historian of the Crimean War. As late as 1953, when a student asked him how he should go about becoming a historian, Churchill replied, "Read Kinglake!" Scholars who have read Kinglake tell me they can trace the development of Churchill's narrative style in those volumes. 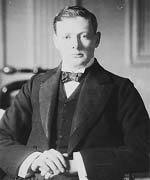 He developed more historical discipline while writing the biography of his father, Lord Randolph Churchill, in 1908. Then he introduced the personal narrative with his account of World War I, The World Crisis. Here, as later with The Second World War, Churchill followed the example of Daniel Defoe's Memoirs of a Cavalier , describing great events while explaining (defending, in some cases) the role he had played in them. "It would be a much less haunting story if Lord Randolph learned the truth. But it is very much in Winston's character that he leaves his father in the dark." 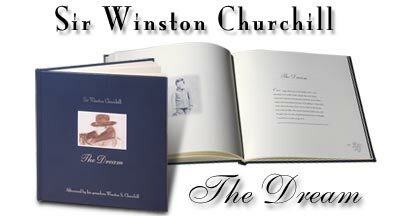 LP: In The Dream , Winston tells his father about the two world wars but never alludes to his role in them. Since this was Winston's story, why didn't he use it as an opportunity to redeem himself with his father - if only in his dream? RML: This is the most poignant aspect of The Dream and the one that puzzles the reader. You'll recall that Churchill said that history would be kind to him because he intended to write that history himself. He was so anxious to defend and explain his actions in both world wars. Why was he reticent to lay the same case before his father? "Part of the reason he doesn't try to redeem himself in The Dream lies in the fatalism that was always part of his character." materialize. Late in life he remarked, "Yes, I have worked very hard and accomplished a great deal - only to accomplish little in the end." Part of the reason he doesn't try to redeem himself in The Dream lies, I suspect, in this attitude - and also in the fatalism that was always part of his character. Churchill had defied fate, resisting the idea that foreign tyrants were invincible, for example - no prominent British leader save Churchill, in 1940, would have stayed in the war after Dunkirk. Yet at the same time he had this fatalistic notion that he had achieved nothing permanent, no transcendental greatness. The Dream offers him one last chance - but what would he say? His father is almost disbelieving as Winston unwinds the terrible history of the 20th century. Would he have believed that his son, in 1940, stood alone between civilization and barbarism? It is a question for readers of The Dream to answer. It is part of the artistry of the tale that the inquisitive young father in his 40s never learns the role his 73-year-old son played in the world. It would be a much less haunting story if Lord Randolph learned the truth. But it is very much in Winston's character that he leaves his father in the dark. LP: What's the abiding lesson of The Dream for fathers and sons-and parents and children? RML: Oh my - that sounds like the old fraternity initiation question, "State your philosophy for living among men." For children, perhaps the lesson is: hold nothing back - life is too short. Young Winston was badly affected when his father, whom he so adored, refused to take him seriously, and was gone before Winston could prove his worth. We lose our parents and then we say to ourselves, why didn't we do this and that? Why didn't we talk over X and Y while they were still with us? But it is too late. The Dream focuses on the implications of that mistake. "Perhaps the lesson is: hold nothing back - life is too short." expect their sons to have their virtues without their faults." But Randolph, while living, never expressed such kindly understanding to his son. Historically, the passing of Lord Randolph in 1895 marked the beginning of Winston's meteoric career: soldier, author, statesman. Think of what happened just in these twelve months. He met his chief mentor, Bourke Cockran; paid his first visit to "The Great Republic"; heard bullets fired in anger for the first time, in Cuba; and began his self-education, with books sent by a new ally who henceforth would be devoted to him: his mother. Churchill once said, "Nothing surpasses 1940." Yet until 1940, nothing surpassed 1895.
life of glorious epitomes and stunning vindications."